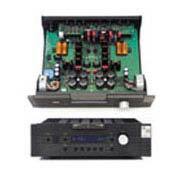 Balanced Audio Technology is pleased to introduce the superlative new VK-40 solid-state balanced preamplifier. The VK-40 establishes a benchmark in solid-state preamplifier performance by combining BAT's trademark high current Unistage topology with a wonderfully flexible and easy to use customer interface. Balanced Audio Technology's proprietary electronic shunt volume control in the VK-40 retains the use of Vishay bulk metal-foil resistors in the signal path - while expanding its range to include 140 steps of 0.5dB. Flexible input assignment is available via an easy-to-read twelve character alphanumeric display. Full remote control of source selection, volume, balance, phase, and mono/stereo switching is now available via a sophisticated machined-case transmitter. Indeed, even differences in source signal levels can be compensated for, while preset balance or phase adjustments can be assigned to each source individually. Additional flexibility is offered in the form of an optional easy to install plug-in phono module that can handle both MM and MC phono cartridges. The details and 3D this amp can project are gorgeous.